First impression? Like any 1:6th scale, this car is BIG - almost 2 1/4 feet long. 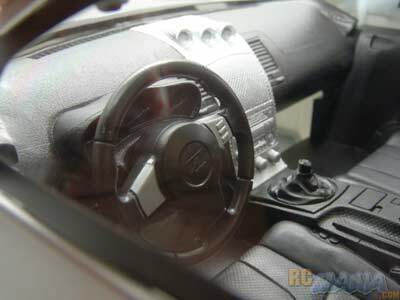 Not only that, but it looks surprisingly realistic for an RC. 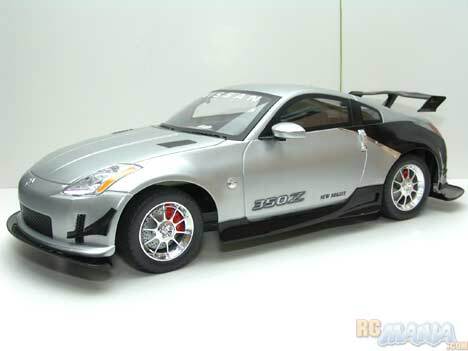 This is obviously a fully licensed model, as the shape & styling of the real Nissan 350Z has been captured perfectly. New Bright has included a 9.6V battery and charger with this car, plus a 9V battery for the transmitter. I love getting a complete package. 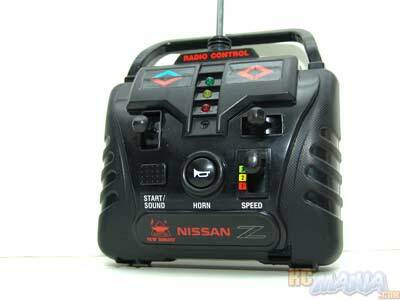 Although New Bright has their own special type and shape of rechargable battery, the 350Z has an extra plug in the battery tray that allows you to connect a standard 9.6V pack from Nikko or Tyco, so if you already have one of those, you can have multiple batteries charged at once and use them back to back. Now, another interesting thing about this car is the transmitter. In addition to your normal front/back and left/right controls, it includes a speed selector switch that's sort of like a transmission shift lever, plus there is a horn and a startup button. There's also no on/off switch on the controller. Looks interesting! Pressing the Start button on the controller brings this Nissan to surprising life with a realistic engine startup sound that actually comes from the car. When you shift the speed selector, the car revs. Go forward or back, and the engine sound accelerates. The horn works quickly as well. This is a lot of fun. The New Bright Z is actually decently fast for its size, given that it's powered by a relatively small 9.6V battery (normally used on 1/14th to 1/10th scale RC vehicles). I'd say it's fast enough to be fun and safe. A car this big going too fast could probably do some damage or really hurt if it hit something or someone! Steering is responsive and consistent, and sharp enough that you can whip some brief slides by tapping reverse a moment after you begin a turn. The sheer size of the car makes it a real pleasure to watch -- you almost feel like you're driving just a small, real car. 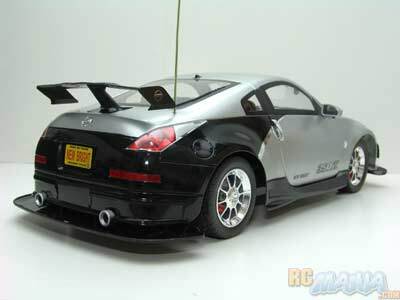 The New Bright Nissan 350Z 1/6th scale is a pretty good deal for the sheer amount of car you get. The inclusion of all the batteries you need plus a charger adds a lot to the value, and the attention to detail is really pleasing. The sounds make it even more fun still. Handling on the road is great. I only wish the car had a little more speed!